Bernard Hepton, who has died at 82, was an actor who graduated from the repertory company of Bradford’s considerable post-war Playhouse and who became a household name in a wartime TV drama. A native of Bradford, he also brought to life the central character in the most famous work by another of its sons, JB Priestley’s An Inspector Calls, and made a significant impact at Yorkshire Television, as part of the ensemble in the seminal 1972 drama series, The Organization. It was as the honourable and conflicted camp Kommandant – we never learned his full name – in the BBC’s Colditz, between 1972 and 1974, that he achieved his greatest fame. The series was an institution in its day, and Hepton’s character, aghast at the excesses of the Nazis and fighting vainly to keep his prisoner of war camp under regular army control and out of the hands of the SS, gave it a depth that set it apart. Hepton had grown up in the same Bradford street as Priestley, though two decades separated them. He was the son of Bernard Heptonstall, an electrician, and Hilda, who was from a family of mill workers. He trained as a draughtsman but it was in the evenings, at the Playhouse, that he found his vocation. The theatre was briefly under the direction of Esme Church, a Shakespearean actress who would become head of the Old Vic Theatre School. She had gone there in 1944, and used its facilities to set up the Northern Theatre School on Chapel Street. Her astonishingly stellar roster there also included Tom Bell, Billie Whitelaw, William Gaunt, Edward Petherbridge and Coronation Street’s Bryan Mosley. Hepton was her first student, and his career trajectory took him quickly to York, working for two years in fortnightly rep, and then to Windsor, Birmingham and the Mersey, where he assumed the directorship of the Liverpool Playhouse in 1963. In the meantime he had an uncredited role as a soldier in Olivier’s Richard III and as Sir Thomas More in a live TV adaptation of A Man for All Seasons, transmitted from the BBC’s Birmingham studio on New Year’s Day, 1957. It was to be the latter medium that would be his métier. He was Wemmick in the 1967 BBC serialisation of Dickens’ Great Expectations, and Mr Farebrother in a version the following year of George Eliot’s Middlemarch. More controversially, he played Caiphas in Dennis Potter’s Son of Man, a BBC Wednesday Play which gave rise to accusations from Mary Whitehouse of blasphemy. The 1970s saw him at his most productive, across a range of genres. In Jack Rosenthal’s comedy for Thames, Sadie It’s Cold Outside, he and Rosemary Leach were a world-weary middle-aged couple lamenting their lost dreams in an exhausting, increasingly hostile world. The Organization, recorded in Leeds, saw him as a harangued press office in a corporate environment which the writer Philip Mackie had based on his experiences across the Pennines at Granada in the 1960s. In complete contrast, he portrayed Thomas Cranmer, a leader of the English Reformation, in both The Six Wives of Henry VIII and Elizabeth R, and in the film adaptation of the former, Henry VIII and His Six Wives. He was also Pallas in the celebrated 1976 production of I, Claudius in 1976. But none of these matched the attention commanded by Colditz. Edward Hardwicke and Anthony Valentine were on its front line. Hepton ended the decade with a memorable turn as the intelligence officer Toby Esterhase, alongside Alec Guinness in Tinker Tailor Soldier Spy. Shortly thereafter he was cast as Inspector Goole in a BBC adaptation of An Inspector Calls, which, given his background, he considered a career highlight. He married the actress Nancie Jackson in 1957 and she played his wife, Alice, in A Man for All Seasons. 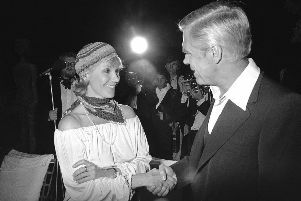 After her death, he married Hilary Liddell in 1977. She died five years ago, and he is survived by a niece and nephew.